Amazon 5 Stars Sam is struggling, even more so now that she has a family. She’s just dealing with not remembering parts of her life. Thompson writes this story well, and in different POVs, it brings a unique look into Sam’s life. With spells and magic, and new friends, Sam is a new person. She grows as a character and has a back story that is a major part of the current story. I’m a fan of Thompson, and this book is the best one of hers that I’ve read so far. Lynn Thompson’s home is in the Land of Enchantment, and, yes, the land is enchanting. The skies are blue, the stars are bright., and there are beautiful panoramic landscapes surrounding her hometown. Lynn wades through the craziness of life to follow her true passion, writing fiction. You can find her, or not, trekking through the mountains, searching for fairies and vortexes, keeping her eye out for anything paranormal, or sitting in the hot springs in her spare time. Lynn doesn’t have a specific genre she writes in. Characters have a way of leading her stories. She follows. Lynn is also a sponge when it comes to knowledge. She’s always on the move to continue her education in writing, marketing, social media, digital media, and hopes to find the extra time to add some criminal investigation classes to her repertoire. Lynn has three novels out: Blake, Sterling, and Tarnished Gold. Blake is the beginning of Montana’s story. Her need for seclusion, at least, for one winter. She does not get what she wants. There is someone or something in the mountains stalking her, people keep showing up on her doorstep, and she meets Max. Max knows what is hunting Montana, but won’t tell her. Montana’s lack of trust in Max drives her to fix her own problems. If she had known what she’d be confronting that night, she never would have sedated Max. Sterling is the second novel in the Montana Dayton series. Montana moves to Florida hoping to escape her old life, and regain her normal life back, but her past has come back to haunt her. Not only does she start losing time, she continues to wake up every morning wearing gorgeous jewels and is surrounded by precious gems. She never remembers where, or who she’s getting the glittery baubles from and is hell bent to get back her memories and return the jewels. Afraid she has been out robbing houses in the middle of the night, she is determined to figure out what is happening on her own. That is until the dreams and the strong pull to explore the gulf. When she finally realizes she needs help, she is powerless to get it. 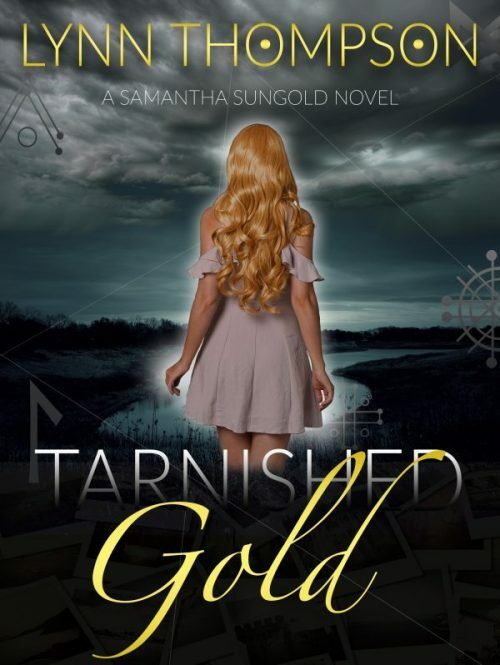 Tarnished Gold is Sam’s story and will be coming out around the new year. Sam first appeared in Sterling and demanded her own novel. Lynn has bowed to Sam’s wishes and is writing that story now. Dark Fates. Eight short stories that are fun, but still on the dark side. Dark Fates-Madness. Four dark short stories. News Worthy. News Worthy stands alone with five short stories. Watching the news first thing in the morning may not be fun, but dissecting news clips and rewriting them into short stories that had a different ending was a blast! Dark Fates Collections is compiled of Dark Fates, Dark Fates-Madness, News Worthy, and features Karma Shay’s adventures.